Our family loves Greek food and there are a few small restaurants near us that we frequent. I have always loved feta cheese and greek salads and decided I was going to start making them at home to fulfill the Greek craving without having to get take out or head to the restaurants. 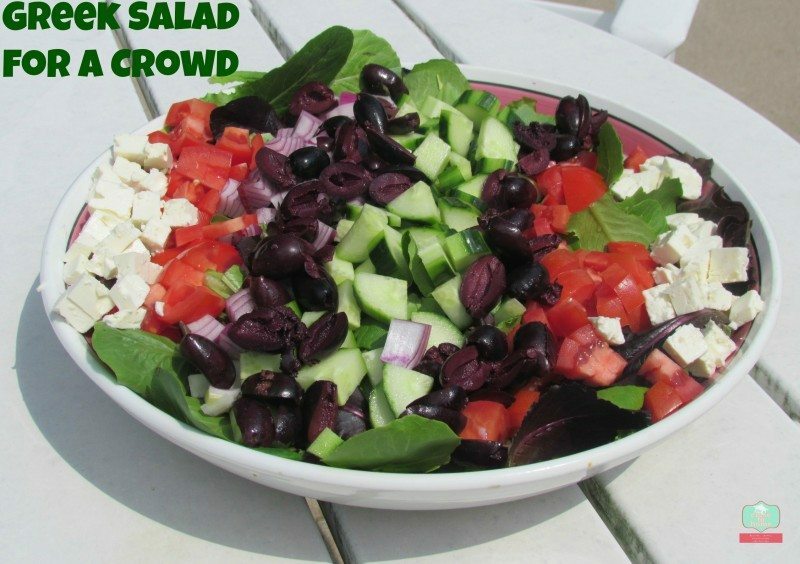 I love making this greek salad recipe for a crowd and layering it in this presentation. You can add some grilled skirt steak or chicken to make it a main course salad recipe. Do not dress the salad until before serving and I like to underdress the salad as each person can add more dressing they can’t take it off. For a little extra kick, take some of the feta from your salad and marinate it in the dressing. It really does make a difference and my brother liked eating the marinated feta right out of the bowl. It is important to get good quality feta. I have purchased less expensive feta and you can definitely tell a difference. 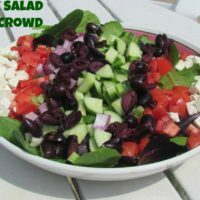 The blocks of feta also tend to be a little tastier and better for this type of salad then the pre-crumbled varieties. I really don’t have a recipe for the Greek Salad itself. Just use romaine Lettuce, either cut up the large leaves or in this salad I used the baby romaine leaves. Add cucumber, tomato, feta, red onion and Kalamata olives. If you can’t find the kalamata olives already pitted there are two ways to do this easily. First depending on the size of the olive, they may fit in your cherry pitter. This is the most simple way and you can get your kids involved. Secondly, just smash them slightly with the side of a knife and then you can pull it apart. A little more time-consuming but better than having your guests bite down on a pit at your party!! 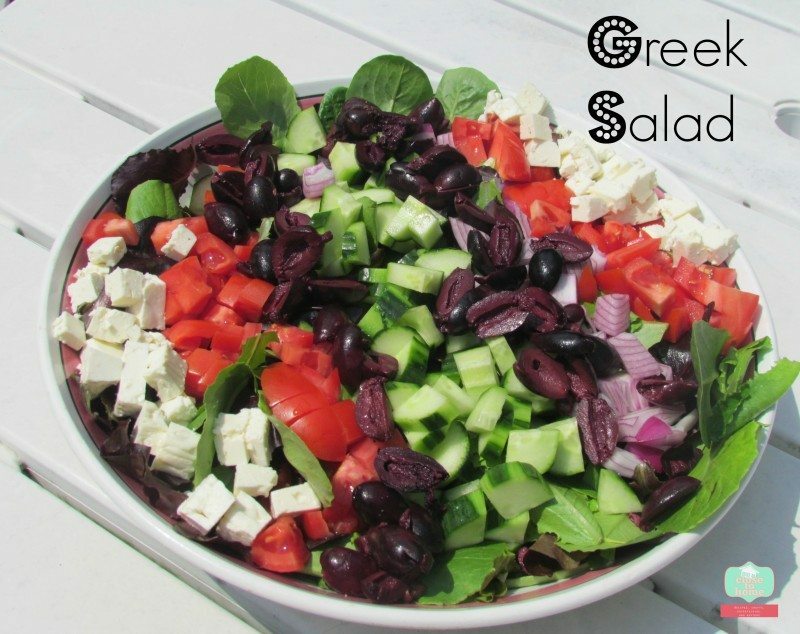 Greek salad is one of our favorites! Love your version. It’s so pretty. I LOVE Greek food. Thanks for sharing this, my tummy will appreciate it. Wow- that looks delicious and so easy to make! Thanks for sharing. I love that you cut the salad pieces into small sizes-it is so much easier to eat. I do like particularly like Feta cheese but maybe I have never tasted a good one. This salad definitely has my mouth watering! Yum girl – I pinned it for you. Yum!! I pinned that one to try out!! It is super easy and will last on your counter for a few weeks too. 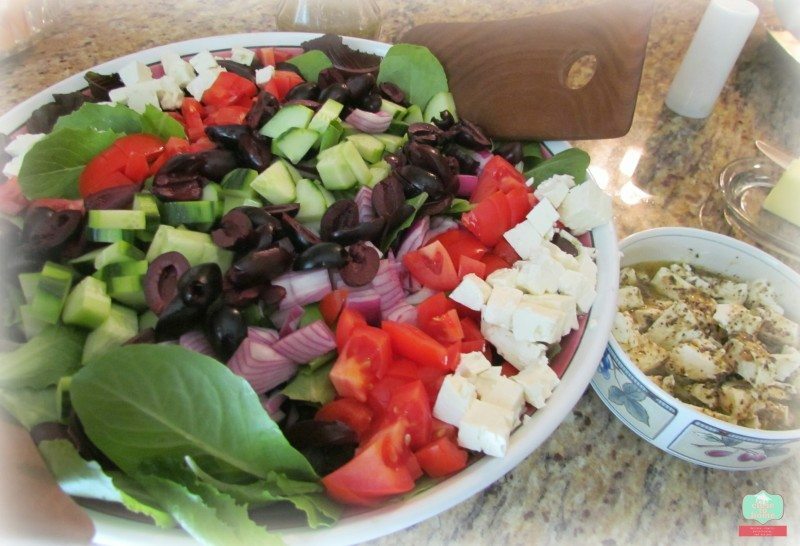 That Greek Salad looks delicious, and I just so happen to have all of the ingredients to make that dressing!